The flood waters, despite valiant attempts to stave off the impact of overflows from the Kaeng Krachan dam, have now reached the main township of Phetchaburi. Residents in the tourist town have built their own floodwalls with concrete blocks and sandbags to brace for overflows from the Phetchaburi river that is expected to hit wide areas this afternoon. 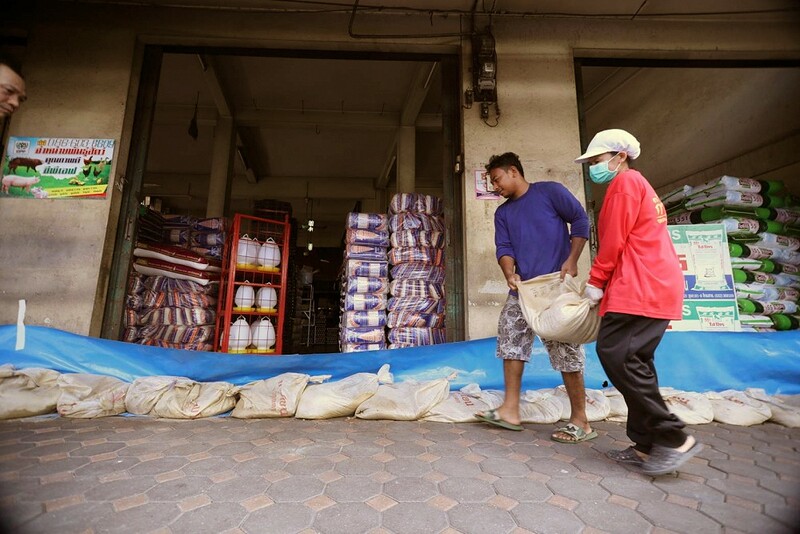 Mr Luesak Rodchusaeng, has told Thai PBS that he had keep abreast with the water conditions from different sources and had placed sand bags in front of his grocery store. The measure, he said, worked in blocking out water during previous flooding. But this time around, he says he has doubts if the sandbag floodwall would withstand the flood waters and decided to strengthen it with concrete blocks and intended to keep it as a permanent feature. Low-lying areas on both sides of the river have now been flooded as officials are warning that the flooding might last several weeks due to excessive water in Kaeng Krachan dam, forcing the dam to drain more water out through the spillway. Songkran around Thailand – where can you get wet? Songkran Festival is an event where an all-out water battle and ancient traditions somehow blend in annual celebration. It’s unlike anything else in the world. And it’s wet. 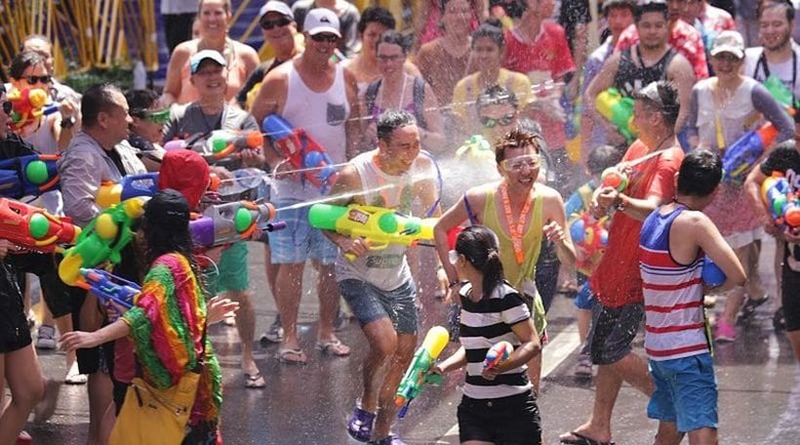 Venturing out onto Thailand’s streets on April 13 is an open invitation to have a bucket of water thrown at you or a loaded water super-soaker aimed in your direction. You WILL get wet. For tourists, the event offers a huge water party breaking out in the streets of Thailand’s towns and villages. For locals, it is a time when they can spend moments with their families and visit temples to make merit – and then get involved in the water fights as well. Songkran is celebrated around Thailand but some of the larger, (slightly organised) water fights and fun are held in the major tourist magnets around the country, notably Bangkok, Phuket, Chiang Mai, Hua Hin, Pattaya and the popular tourist islands. Chiang Mai gets a special notoriety for keeping the water fight going for up to three or four days. 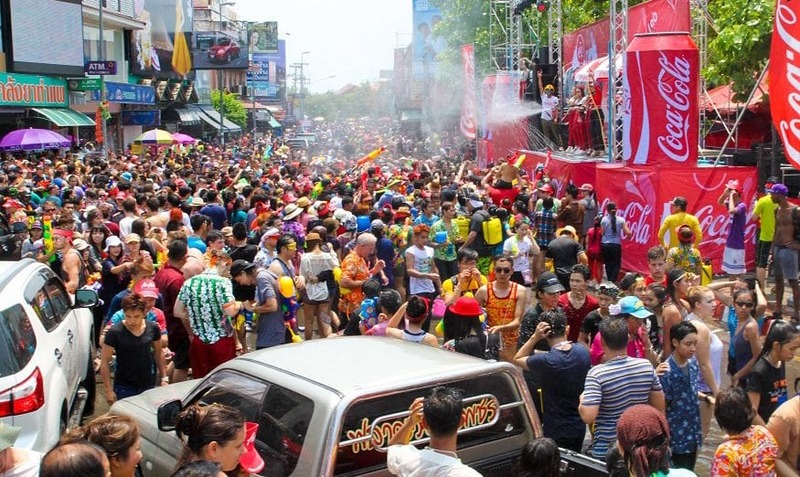 This Songkran 2019 the Tourism Authority of Thailand is organising celebrations in three emerging tourist destinations – Tak, Mukdahan and Ranong – and is supporting activities in eight other provinces (Bangkok, Samut Prakan, Sukhothai, Chiang Mai, Lampang, Ayutthaya, Phuket and Songkhla). Scheduled from April 12-14 at Wat Thai Wattanaram and Naresuan Maharaj Stadium in Mae Sot district, the event celebrates the time-honoured traditions of the Thai Yai ethnic group and the Thai people, with traditional activities including purifying a Buddha image, sand pagoda building and a colourful parade. Other activities are cultural and music performances, a water tunnel display, a folk village, a food fair and local art and craft workshops. Taking place from April 12-16 at Hat Manopirom, Wan Yai district, the event is focused on the theme of ‘Cool Isan’ with a water tunnel and displays, an umbrella tunnel, and a five-region sand pagoda zone as well as a ‘Sand Art Contest.’ The opening ceremony and stage performance is scheduled on April 13. Taking place from April 13-15 at the multi-purpose ground in front of the Mueang Ranong Municipal Office, the event places emphasis on Ranong’s unique local culture with a colourful twist. Highlights include a traditional Songkran parade, an exhibition on the 12 Zodiac signs, and a food fair with 20 booths of rare indigenous food items. There’s an LED-decorated water tunnel display to welcome visitors to various other activities unique to the area including cooking shows, traditional dances, and music performances. Songkran Wisutkasat (April 13-15) on Wisutkasat Road, Under the Rama VIII Bridge. 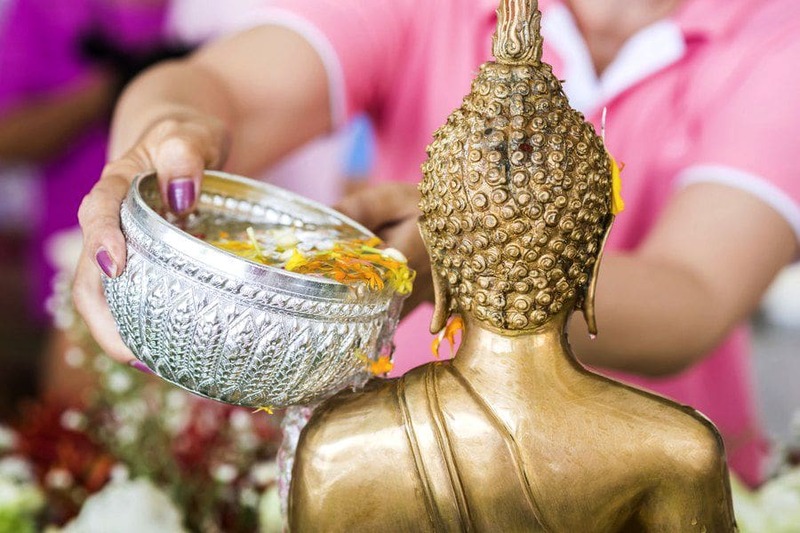 This year marks the 77th anniversary of Songkran Wisutkasat, best known for being the origin of the Miss Songkran Beauty contest in Thailand, with several other cultural activities, including merit making, purifying Buddha image, paying respect to the elders, and a colourful parade. One special activity for this year is free entry to the Bank of Thailand Museum (Bangkhunprom Palace). Songkran Siam Square (April 13-15). This year’s event promotes “Pha Khao Ma” (Thai men’s multi-purpose loincloth) and a ‘safe Songkran’ theme, with cultural activities including purifying Buddha images from four ASEAN countries, cultural and music performances, folk market and water-based fun. Tourists and locals are encouraged to celebrate the festival without chalk powder (din sor pong), alcoholic drinks or wearing revealing clothes. Songkran Phra Pradaeng 2019 (April 19-21) at the Phra Pradaeng City Hall. Phra Pradaeng is where the local people observe Mon ceremonies in a traditional way, and their New Year traditions are very different to those found in the rest of Thailand. For a start, the celebrations here take place a little later, and feature a range of cultural activities including a spectacular floral procession, a parade of the local Mon people in their colourful traditional outfits, a Miss Songkran parade and Mister and Miss Songkran Beauty Contest. Visitors will also have the chance to join merit-making activities in the local temples, pay respect to community elders and enjoy folk plays and cultural performances. Thai Puan’s Elephant Ordination Tradition, Ban Hat Siew (April 7) at Wat Hat Siew in Si Satchanalai district. Held annually for over 175 years, this is an ancient ordination ceremony that all local men must become monks for at least seven days and every year, the ordinations take place on this date. The men prepared in the traditional way are taken to the temples on elephants while wearing local headgear. This ritual is based upon the tale of “Phra Vessandara Chadok” one of the Lord Buddha’s former incarnations. Most of the men leave the temples on Songkran day on April 15 to enjoy New Year with their families. Song Nam – Oi Tan Ceremony, Songkran Si Satchanalai (April 8-12) at the Monument of Phra Mahathammaracha I (Lithai) in Si Satchanalai district. Oi Tan, is a phrase that means to make a donation and relates to the good morals of the people of Sukhothai. The highlight is a procession to pay respects to Phra Maha Thammaracha I, who was king of Sukhothai from 1347 to 1368. Other highlights include cultural parades from the 10 local communities, Lady Oi Tan beauty competition, a food fair and music performance. Songkran and Sawankhalok Food Festival (April 11-15) at the Public Health Park in Sawankhalok district. Here visitors can Song Nam Phraor purifying the three highly-revered Buddha images from the three most important temples of the district, including Wat Sawang Arom Worawihan, Wat Sankaram, and Wat Klong Krajong. Other highlights are a local food fair and a chance to ‘check-in’ at the newly-created ‘Pop Culture’ street art created by famous ASEAN artists. Retro Songkran Splendours, Sukhothai (April 12-14) at Sukhothai Historical Park. Celebrating the ancient city’s status as the cradle of Thai civilization, visitors can embrace the old-style features of the event with traditional costumes and age-old games, parades and merit making. One of the most popular events is the sand pagoda building contest in which families compete to make stunning designs. Flowery Shirt Songkran on Khao Tok Road, Sukhothai (April 12-15) at the Sukhothai city and Sukhothai public park. Tourists and locals are invited to wear colourful Hawaiian-style shirts, which have become a firm Songkran tradition. Highlights include a float procession and the chance to pay respects to the Buddha images, water fun, retro Thai circle dance activities and beauty contests. Hae Nam Kuen Hong Ceremony and Chao Muen Dong Bathing Rite (April 17-19) at the Monument of Chao Muen Dong, Ban Toek sub-district in Si Satchanalai district. Activities include a sacred ceremony to pay respect to the Buddha image of Chao Muen Dong at Ban Toek, folk plays and a procession of elephants as well as cultural parades from 14 local communities. Water-based activities can be enjoyed at Ban Toek-Ban Na Ton Chan tourism communities. Paweni Pi Mai Muang, Chiang Mai (April 12-16). Salung Luang Songkran Festival, Lampang (April 9 – 13) at Khelang Nakorn Park on Tha Kraw Noi Road. Enjoy a huge parade called the Salung Luang procession as well as the Miss and Mister Songkran Contests, floral horse-drawn carriages competitions, cultural shows and a many local performances. Songkran at the Ancient Capital (April 13-15) along the Sri Sanphet Road in front of the TAT Ayutthaya Office. 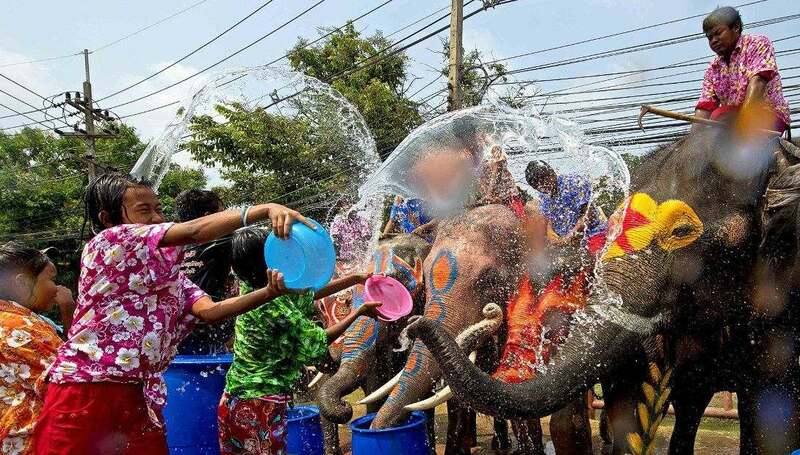 Celebrate Songkran in the most unusual exotic way – water splashing with the elephants in the environs of the UNESCO World Heritage site of Ayutthaya Historical Park and the chance to enjoy the traditional Thai circle dances with the locals. Mon Songkran (April 14) at Wat Thong Bo, Bang Pa-In district. The Mon people have their own traditions when it comes to celebrating Songkran and many of these can be seen in the Bang Pa-in district of Ayutthaya where a range of activities take place around the temple of Wat Thong Bo. These include merit making, bathing of the local Buddha images and cultural parade. The Water Festival on the Beach (April 11-13) at Patong Beach. Songkran No Alcohol (April 13) at Limelight Avenue Mall. Water Festival 2019 (April 14-15) at Dibuk Road. Hat Yai Midnight Songkran 2019 (April 12-15) on the streets of Nipat Uthit 3, Sanehanusorn and Thammanoon Vithi. Cultural activities include a Buddha image parade, purifying Buddha image and local folk plays. Others are beauty contests, Muay Talay sea boxing matches, music concerts and the Songkran Carnival parade. Songkran is a time when family comes first, respect is paid to seniors and people visit the temples to take part in age-old ceremonies. 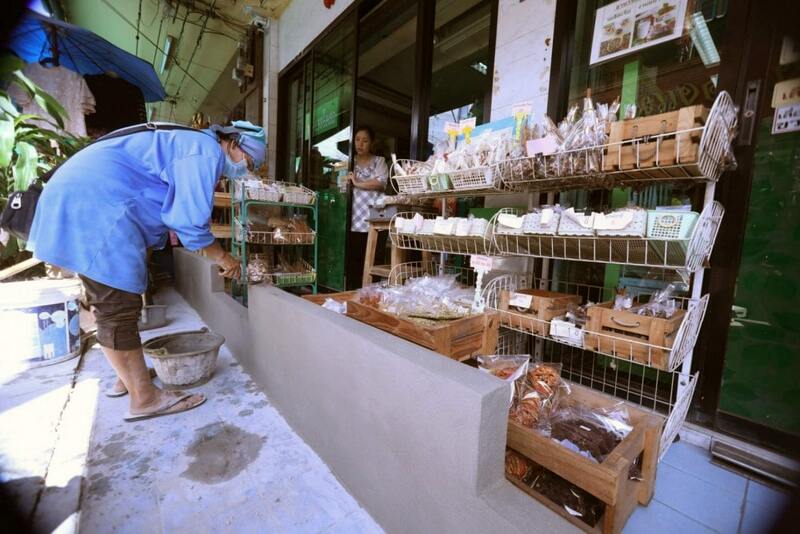 Visitors will get more out of Songkran if they take the time to understand its origins and its traditions. Above all, have an enjoyable and safe time for Thailand’s New Year celebrations. A series of photos that convey everything we should be concerned about in Thailand’s marine ecology. 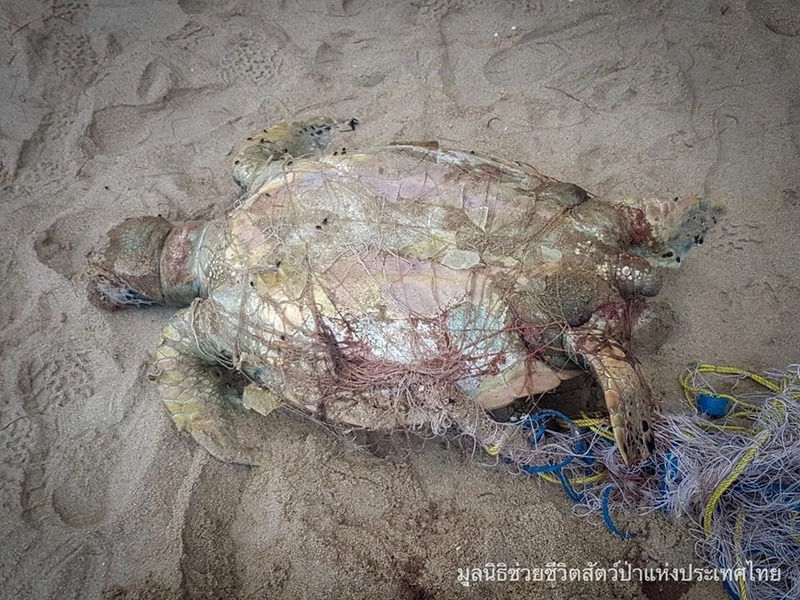 A Green Sea Turtle, tangled in a fishing net, has been washed up on a beach in Prachuap Khiri Khan. 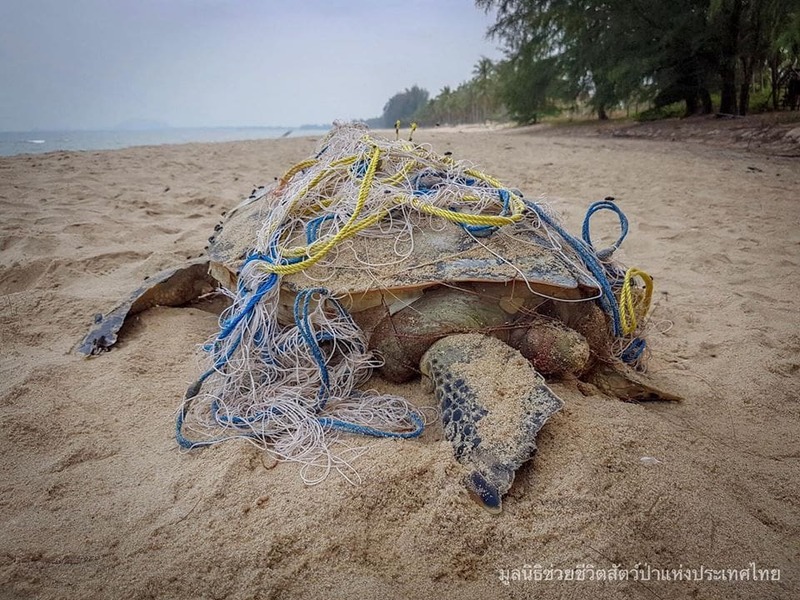 The Department of Marine and Coastal Resources reports that they were notified that a dead sea turtle had been washed up on a beach in Bang Saphan, Prachuap Kiri Khan. The Green Sea turtle was 60 centimetres wide, 64 centimetres long and weighed 18 kilograms. 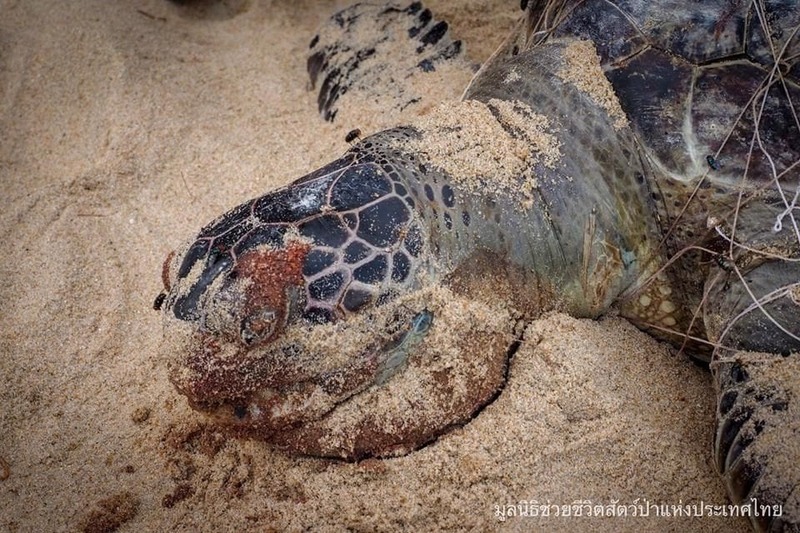 The turtle was already rotting when it was found tangled in the fishing net.